Do you follow along with the One Room Challenge? It’s a twice-yearly decorating challenge where a group of “featured” designers and “guest” participants transform a room in only six weeks. I absolutely love seeing these makeovers come to life and I am SO impressed by what these talented folks accomplish in such a short period of time. Having participated in two of these in the past (my office and guest bedroom), I know how much work goes into it. Each one of these people deserves a serious round of applause. Last week was the big reveal for both the featured designers and guest participants, and I wanted to share my favorites from the Fall 2018 group while they’re still fresh on my mind. If you’re in the mood for some serious inspiration, you’ve come to the right place today! I’ve got everything from kitchens to bedrooms to kids’ playrooms in my round up - be sure to click over to their blog posts to see a ton of other photos and to read more about how the final spaces came together. This master bedroom makeover is the perfect mix of modern and traditional in my book. I love the tone-on-tone look she created with the blue wallpaper and moldings - everything else pops beautifully against those walls! The touches of black give it a little bit of an edge and keep it from going too light and airy. 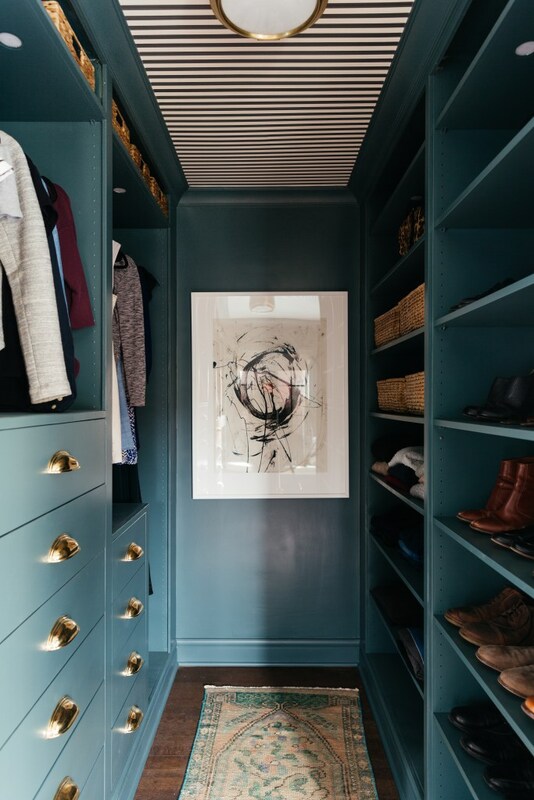 But this isn’t all she did - you have to scroll on down to see the incredible closet she created too! Erin hacked an IKEA Pax system to create a totally custom closet that you’d never believe is IKEA. Seriously. It’s amazing! It’s hard to find the right words to describe my girl Michelle’s character-filled eclectic dining room makeover (she’s a fellow Philadelphia designer and a friend of mine!). Stunning? Fun? Beautiful? It’s definitely all of those things! Your eyes just keep moving around the room to take in all the good stuff that’s going on here. Everything from that gorgeous standout wallpaper to the newly installed picture molding and built-in hutch to the incredible oversized brass chandeliers - I’m a big fan of it all. Since dining rooms don’t tend to have a lot of furniture in them, they’re the perfect spot for some statement wallpaper and light fixtures. You’ll have to head over to Michelle’s blog to see the other side of the room - I won’t spoil it, but there are some really fun touches you don’t want to miss! I’ve got another local designer to give a shoutout to - Nicole from Vestige Home (Philly represent!). From the moment I saw her limewashed walls over on Instagram, I knew this master bedroom was going to be special. She and her husband just moved into this home a few weeks ago and I can’t believe she was able to pull off this moody-modern-meets-historic makeover in the midst of moving chaos! What you can’t see here is that on the other side of the seating area (can we just talk about those gorgeous green velvet chairs?) is an original fireplace - this will be the perfect spot to cozy on up in during the cold winter months. Nicole has an amazing ability to mix old and new and this bedroom really shows that talent off. If fun and quirky is your thing, you’ll definitely want to check out this guest house makeover - yes a WHOLE guest house makeover! I honestly can’t believe Dabito was able to completely transform this space in a matter of six weeks. My favorite part is the kitchenette, which you can see below, but he also managed to create a seating space and a sleeping area, and added a bathroom. Whew! I’m tired just thinking about the work that went into it. You know how “eclectic” can sometimes mean it looks all crazy and dysfunctional? This, my friends, is the opposite of that - it’s an eclectic space done well. The way he uses color, mixes styles, and designs a functional space is so impressive to me. And now onto the guest participants! I immediately fell in love with the simplicity and coziness of this modern traditional master bedroom when I spotted it - don’t you just want to climb into that bed and take a nice afternoon nap? That Scandinavian-style spindle bed is one I’ve eyed for ages and it’s absolutely perfect in here. The blue Persian-style traditional rug really grounds the bed and it extends over to the other side of the room where the newly-installed fireplace lives! You’ll want to head over to see that cute little spot on Emily’s blog - the lines of it give a nod to her Tudor-style house, but it still feels fresh and modern at the same time. I’m beyond impressed with the folks who are able to pull off a whole kitchen reno in six weeks and this one turned out so incredibly well! I‘m digging the clean, modern look of the cabinets mixed with some open shelving, as well as the black hardware. Those bar stools have been favorites of mine for a long time too - maybe in our next house we’ll have a good spot for some! The final thing I want to point out in this kitchen is the subway tile. If you look closely, you’ll see that it has a handmade, irregular look to it that really adds something special. There are SO many different kinds of subway tile out there now that can give you that classic look, but also have a slightly unique twist. 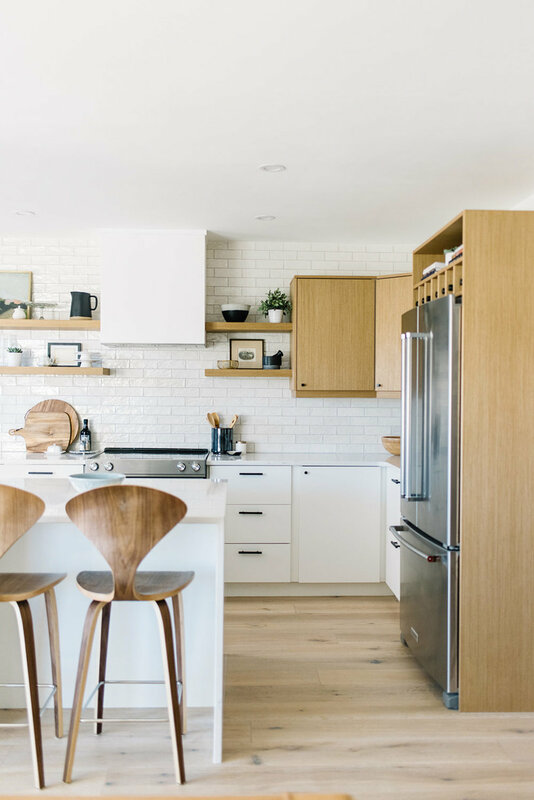 I did a double take when I realized that Jenny kept her all of her original cabinets in this modern coastal kitchen makeover! It looks so different now thanks to fresh white and navy paint, new floors, and all of her other beautiful touches. I especially love the lighting she chose - you can see the brass pendants over the island and the rattan fixture over the breakfast nook in the shot below - but don’t miss the double sconce she has over her sink too. Also, I know it’s hard to see here, but there’s a subtle wallpaper on the walls that’s so pretty and gives this space a little something extra that takes it to the next level. Sarah never ceases to amaze me with her projects. She DIYs a TON and is always so creative. Her basement underwent a major transformation during these last six weeks and I’m a huge fan of how it turned out. It went from storage central to eclectic modern living space and I’m loving it all. It’s divided into two areas by an open built-in bookcase: one side is a lounge area and the other is a nook with a hanging chair. The simplicity of the nook with its art ledges was the part that really make me go wow. Hello high contrast! How fun and cheerful is this colorful modern playroom? If I was under the age of 10, this would be my number one hangout spot for sure. It’s functional, but still super stylish, and can grow with the kids as they get older. I just started a playroom for an e-design client and this space is definitely getting my wheels turning. The eclectic gallery wall is a great way to fill that big wall and I really like that bookshelf that’s underneath it. It adds some great storage and allows toys to stay out in the open, which hopefully means the kiddos will play with them more often! If we have to do laundry (which we all do! ), it might as well be in a pretty space, right? 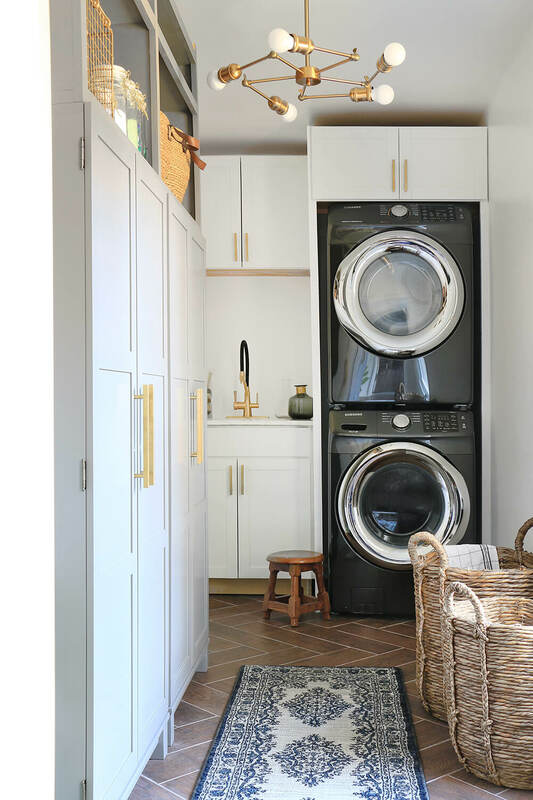 Ursula made the most of her small laundry room by adding floor-to-ceiling storage, stacking her washer/dryer, and building in a sink. The clean, modern style would definitely motivate me to want to get the oh-so necessary task of laundry done with a much happier attitude. I like how she chose to mix gray and white cabinets in here, but kept things cohesive by using the same brass hardware throughout. The modern brass light fixture is a great touch too! 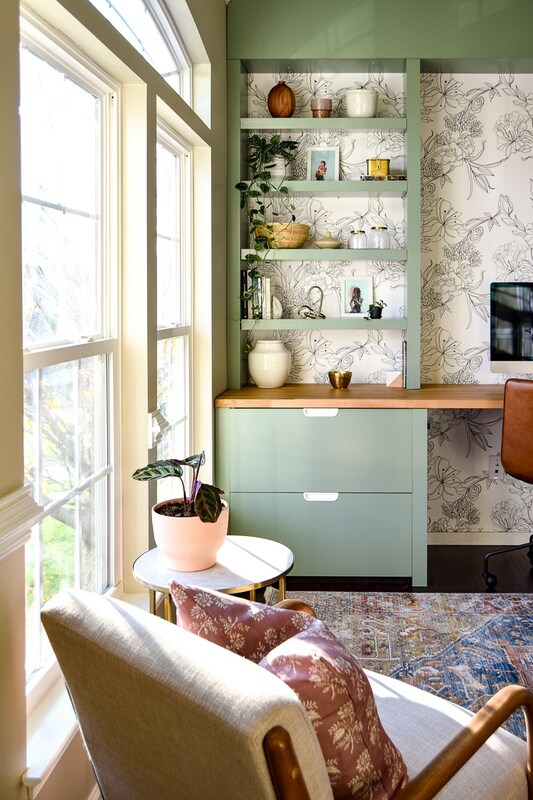 Let’s close things out with this gorgeous green home office. I am so impressed with the work that went into making the built-in desk in this space. You’ll have to read the story about it over on Sarah’s blog. The green she chose is perfect in here and it, along with the wallpaper, creates such a dynamic focal point. There’s a sweet seating area behind the desk as well, which really polishes off this room! So that’s what I’ve got for you from the fall edition of the One Room Challenge! Did y’all have any favorites from this list or did you spot others I didn’t include? I’d love to know!